It was my day off yesterday and I woke up to the news of Angelina Jolie and Brad Pitt. It was not a good start to the day. I couldn't believe it when I first heard it, but as the day went on it started to sink in. This IT couple has been together for 12 years and hearts are breaking everywhere over this news. I can only imagine how hard this is for them. We at DTC are sending nothing but love and support. Anyways, I was going to share this review yesterday but after the not-so-good start I spent most of my day watching Asian drama. (Ha) Very unproductive, I know, but I needed something to patch this over. In case you are wondering, I'm currently watching Cinderella & Four Knights and Love O2O. I was watching Scarlet Heart Ryeo, but I'm putting that on hold for a bit. I generally like to watch dramas after the season has ended so I don't have to wait eagerly every week. Although there are some exceptions and these are usually dramas that I just can't wait! 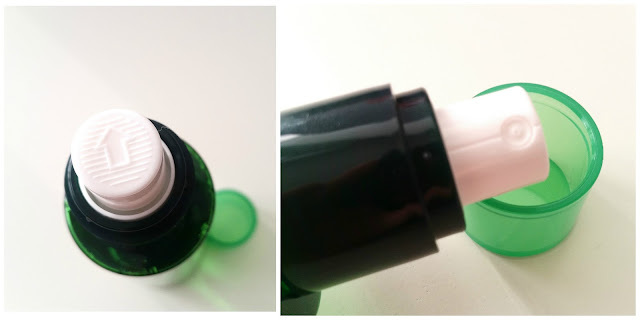 Moving on, this review is all about the Innisfree Aloe Revital Skin Mist. I've been using this all summer and I'm just about 2/3 way done with my first bottle. Yes, I have 2 of these. I purchased them during Innisfree's Mist Festival sale, the same sale that I got my Canola Honey Jelly Mists from. I probably would have tried this mist sooner but I find I go through mists rather slowly. I thought I would carry them everywhere I go and use them whenever. However, while I do carry one everywhere I go, I don't always have the time to use it. Come to think of it, I really use mists more often when I'm at home than when I'm out. Nevertheless, I've been using this Innisfree Aloe mist all summer and it's definitely grown on me. Let's get to know it! Product Description: The Innisfree Aloe Revital Skin Mist is a moisturizing and refreshing facial mist great for summer. It contains 94% Jeju Organic Aloe extract that can help to soothe, hydrate, and revitalize the skin. Aloe is a great after-sun product, and this mist is great for a hot summer day. 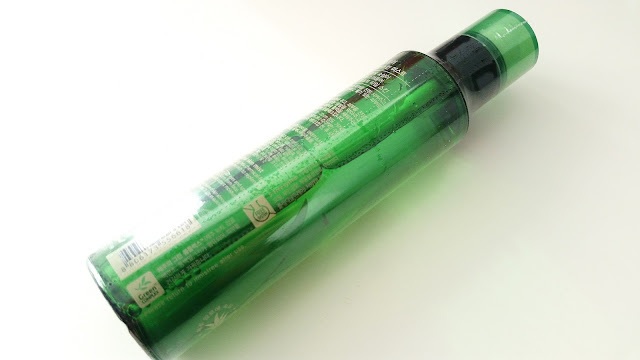 This mist utilizes Innisfree's Aloe Vitalizing Energy. It's a special skin-vitalizing complex made to strengthen the skin barrier, prevent loss of moisture, and more. To Use: Close your eyes and spray the mist 20 cm to 30 cm from face. The mist can be used after cleansing or before/after makeup. Use anytime when the skin feels dry and needs instant hydration. Mist is wrapped in a plastic wrapper. 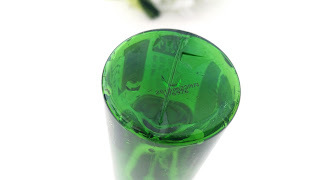 Ingredients: ALOE BARBADENSIS LEAF EXTRACT, BUTYLENE GLYCOL, MADECASSOSIDE, CITRUS UNSHIU PEEL EXTRACT, ORCHID EXTRACT, CAMELLIA SINENSIS LEAF EXTRACT, CAMELLIA JAPONICA LEAF EXTRACT, OPUNTIA COCCINELLIFERA FRUIT EXTRACT, PHENOXYETHANOL. Packaging: Unlike the Honey Jelly Mist, this Aloe mist didn't come with an outer box packaging. Instead, it's wrapped in a plastic wrapper which needs to be removed before usage. The Aloe mist is stored in a bottle with a spray top. It has information in both English and Korean on its packaging. The expiration date can be found at the bottom of the bottle. Once opened, the mist is good for 12 months. Scent: I'm indifferent about the scent. It's light, refreshing and it smells a bit like aloe. Color: The mist is colorless. Texture: The mist has the same consistency as water. 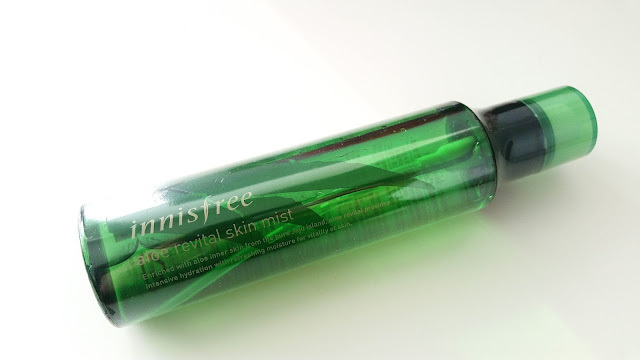 Michelle's Thoughts: This Innisfree Aloe Revital Skin Mist is light and refreshing, perfect for summer time. It's really gentle and has no added fragrances. Making it a great option for those with sensitive skin like myself or for those sensitive to scents in products. I've only tried a few mists so far, so there's not a lot to compare to. However, compared to the mists I've tried, this is by far the lightest. By lightest I mean the most refreshing and possibly least moisturizing. This Aloe mist is not as moisturizing as the Honey Jelly Mist, so if a moisturizing mist is what you are looking for this probably won't do. However, I found myself liking this mist more and more even though it's not as moisturizing as I would like. I think what grew on me was its calming and soothing effects. When my skin feels irritated, I use this mist. On a super hot day and I need some cooling off, I use this mist. Sometimes, I even use this mist before I use my toner just to add some extra soothing effects. I find the mist absorbs into the skin quickly and doesn't leave behind any sticky residues. Maybe it's because Innifree's Aloe mist is lighter that the spray seems finer than the Honey mist from the same brand. I looked at the 2 pumps and they both look similar, so I can only conclude that the mists' consistencies probably have something to do with it. Since the Honey mist is a jelly mist, the product is a bit thicker in the bottle whereas the Aloe mist has the same texture as water. While I couldn't use the Honey mist over makeup, I can use the Aloe mist over makeup. As long as I spray with the right distance and angle, it generally works out well. Final Thoughts: I like this mist for its soothing and calming effect, but I'm a little sad that it lacks in the moisturizing department. If only it was a bit more moisturizing, it would have been pretty perfect. I think this light mist is great for summer and I know I'll be saving my other bottle for next summer. I will probably finish my current bottle and switch to another more moisturizing mist for the fall/winter time. Will I repurchase this in the future? To be honest, probably not. I do have another unopened bottle which I will save for next summer. However, I also have other mists in my stash and there are many more on my wishlist that I want to try. So, while this mist is soothing and calming, it's not enough to make it to my repurchase list. I'm glad I gave it a try though. Do I think this is worth a try? If you are looking for a super moisturizing mist, you can give this a skip. However, if you are looking for a light mist to use over summer that's also soothing, calming, refreshing, and gentle than do give this a try.